Do Happy Meal Toys make kids fat? In November 2010, the San Francisco board of supervisors voted to ban McDonald's Happy Meal Toys - siting the rise in childhood obesity. How about we ban stupidity in government? Santa Clara county has already enacted a ban on Happy Meal toys. "We're part of a movement that is moving forward an agenda of food justice," said Supervisor Eric Mar, who sponsored the measure. Food JUSTICE? FOOD JUSTICE? Where do these people come up with these terms? FOOD JUSTICE? And this is what is causing obesity in America? I've got two words for you besides FOOD JUSTICE. How about PARENTAL RESPONSIBILITY? 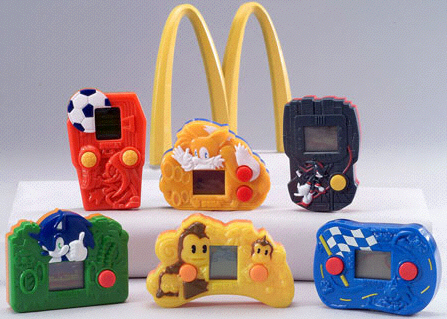 Kids aren't getting fat because of McDonald's and their cheap Chinese toys. Kids are getting fat because they don't get any direction from their fat parents. I've been to McDonald's with my daughter dozens of times and there is a definite pattern. Parents that have normal body weights and look like they are in shape have kids that have normal body weights and look like they are in shape. Large waddling parents that seem to have no clue about their own diet and nutrition have large waddling kids that sit and eat in the McDonald's play area and rarely play. At the local parks, normal weight kids would eat their happy meals and then run around, swing, play on the jungle gyms and chase each other. Obese kids sat with their parents at the picnic tables and ate. They never played. ALL the damn kids had the damn toys. IS ANYONE SEEING WHAT I'M SEEING? Not every meal can be eaten at McDonald's. Nutrition begins at HOME. Lifestyle choices about diet and EXERCISE begin at HOME. My daughter won't eat an apple. But that would be one of the fruit choices in a McDonald's Happy Meal. She loves the Happy Meal with the McNuggets, but would also want a Filet-o-Fish sandwich on the side. That's a relatively high amount of calories. However, we would spend an hour after our meal in the play area and she'd climb up and down for the entire hour. My daughter doesn't have a weight problem and is very athletic - even though she doesn't participate in organized sports. I always got involved in the play area, too. I'd swing her around, crawl on the floor, toss those cheap toys up the slide tube and organize games of hide-and-seek with the other kids. They'd all scurry up the ladders and slides and then I'd go around tapping the tubes to see where there were. The kids loved it. All of us MOVED AROUND and BURNED CALORIES. Many of the older McDonald's don't have play areas. I have yet to see one here in Cleveland. I miss the interaction with the other kids and parents in the play areas. I hope this action in San Francisco does not catch on. Although, I've heard rumblings that this same ban might be adopted in New York City. What a silly waste of our politician's time. Why don't they just ban potato chips and Ho-Ho's from the grocery store. Shut down the bakery departments and put all the cookies and sugary drinks at the top of 90 stairs? We need to end the "Mommy State" mentality that flourishes in highly liberal strongholds. Let us make our own choices. Some of my best memories with my daughter came from playing with and abusing a Happy Meal toy. We still laugh about those times. I don't want the government taking away my fun. I can manage my daughter's diet. That's what I'm supposed to do as a parent. Other parents should take notice. And then we wouldn't have moronic laws like San Francisco Bans McDonald's Happy Meal Toys.